Just before midnight on Saturday, 7th July, the Hvalur hf. fin whaling company landed its 22nd catch of the season at the whaling station at Hvalfjörður, Iceland. The whale hauled up the slipway immediately caught the attention of Arne Feuerhahn, a German conservationist documenting the hunt as it was strikingly different in appearance to a fin whale. Whaling company Hvalur hf, lead by CEO, Kristján Loftsson resumed the controversial fin whale hunt on 22nd June after a two year break. The season could see as many as 238 endangered fin whales killed under a self-allocated quota, which defies the international ban on commercial whaling. 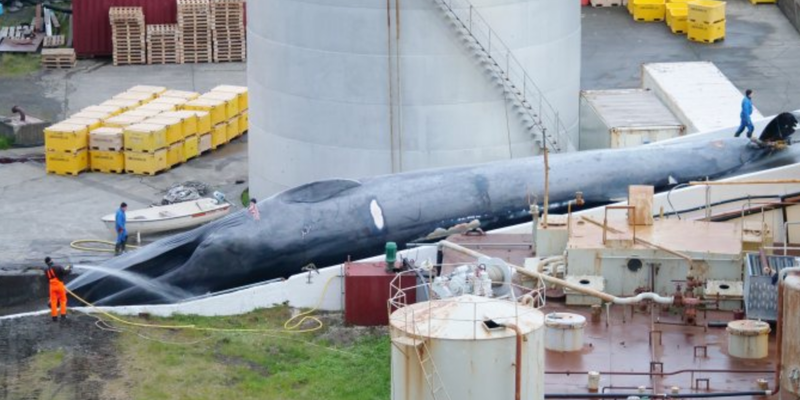 Blue whale experts have studied the images of the whale landed last Sunday and conclude that it is a either a male blue whale or a blue/fin hybrid. Blue whales are the largest creature on the planet. Reaching as much as 33m in length, they are listed as endangered, with a global population estimated at only 10,000 – 25,000 individuals. They have been protected from hunting since 1966 and are the symbol of the mass slaughter that was industrial whaling in the 20th century. It is estimated that up to 90% of the global population of blues was wiped out by commercial whaling operations.